Cirrhosis and sleep disturbances – How much do we know about them? Cirrhosis patients often experience disturbances in their sleeping patterns, which largely affect their quality of life. While western medical theory often treats health issues by looking at organs individually, Chinese medical theory has a different perspective when it comes to viewing the human body. To tackle the problem of disturbed sleeping patterns in cirrhosis patients, we can first take a look at how Chinese medical theory views the liver and the brain. Often named as the “Sea of Marrow”, the brain does not only control memory but also the circulation of Qi, a type of energy that can be interpreted as “life force” which maintains the healthy state of our bodies. And the linkage between the brain and the liver is that the liver also takes care of the flow of Qi and emotions. When a person is stressed, not only does the brain suffer but also the liver. In TCM, psychological illnesses such as depression have long been treated by managing the liver Qi circulation through the use of herbs that promote such circulation in the liver. According to a research conducted by Indiana University School of Medicine, 81% of cirrhosis patients suffer from sleeping disturbances. Their most common complaints are insomnia, hypersomnia, and unusual events associated with sleep, for example apnea and heavy snoring. Even though sleeping problems are common among cirrhosis patients, little research have been done to investigate the possible causes of this phenomenon. Based on a study conducted by National Center for Biotechnology Information, impaired hepatic melatonin metabolism is observed among cirrhosis patients. In a healthy individual, melatonin, a hormone that is released at night to induce sleep, will increase in level at around 9pm and stay in blood for the next 12 hours. However, in cirrhosis patients, their melatonin levels are higher during the day and the onset of melatonin peaking is often delayed at night. Another possible cause is cirrhosis patients’ sleep-wake and circadian abnormalities. Circadian rhythm refers to mental, physical, and behavioural changes driven by a circadian clock that repeats around every 24 hours. It is noticed that cirrhosis patients have a preference for activities at night when compared with other healthy individuals. The tendency of preferring doing activities at night could alter the natural circadian cycle. 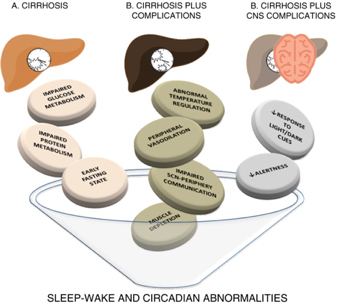 Below shows a figure presenting other possible mechanisms that might affect circadian regulations in cirrhosis patients. Common ways to improve cirrhosis patients’ sleep disturbances is light therapy. Patients will be exposed to artificial light that mimics natural outdoor light so as to bring back the natural circadian cycle. The advantage of this treatment is the lack of toxicity since most patients are already taking quite a number of pills for their cirrhosis treatments. Patients can also practice regular sleeping schedule and avoid over exposure to light in the evening. While treatments like this do help, from Chinese medical theory’s point of view, it is crucial to bear in mind that the health of the brain and the liver are interconnected. Since sleep disturbance is caused by a malfunctioning liver, it is always a good measure to improve the liver function first. Based on a research that studies the effectiveness of herbal liver therapy, patients of liver diseases who were provided with the said herbal supplement showed a significant decrease in their transaminases level, suggesting a drop in their liver damage degree. User reviews also show that patients have more energy in their daily lives afterwards. All these suggest that once the liver function is improved, so will the quality of sleep.